Ms Lewis — one of Bermuda’s top athletes — had an excellent racing season in 2015, which saw her win Bermuda’s first ever major medals in para-sports, winning gold at the Parapan Am Games in Toronto as well as bronze at the IPC World Championships in Qatar. 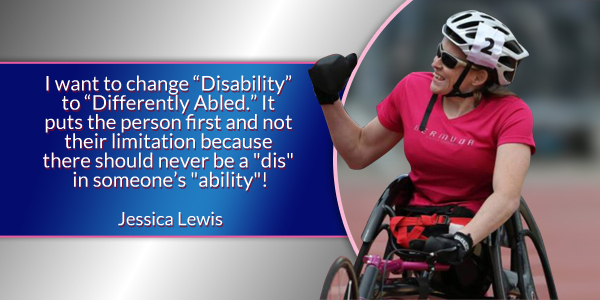 “A disability can also be seen as an inability to do something. This term is placed on a select group of individuals in the world and is something that needs to be redefined and be seen in a different way. “There is a negative connotation that comes along with this term that has been socially constructed. The reality of it is that everyone has a disability. “Now, I know the previous statement is a big one, and maybe even one people don’t want to associate with, so let’s break it down. If someone isn’t able to snap their fingers, or whistle, wouldn’t’ that be considered a disability? Looking at the definition above, it is an inability to do something, right? “So my question is, why are some disabilities looked down upon and pitied and others aren’t? Just because we aren’t able to do things like walk, see, or hear, we should not be pitied. “We all have limitations of some kind, some more visible then others, but that doesn’t mean they should be treated differently. Our inabilities shouldn’t be the focus of who we are. “The label creates a negative mindset on society as a whole, individuals, and maybe even the individuals who have the label attached to them, because it focuses on inabilities. It labels people as incapable right off the bat and allows for perceptions of people before they even get a chance to meet you. “We can learn so much from one another if we have an open mind and stop jumping to conclusions when we see people. I can’t even begin to count the amount of times people will not talk to me and will talk to the person I am with because they don’t think I have a working brain or can speak for myself. “Let’s work together and educate others to change this negative mindset and see the person for who they are not for what they are not able to do. “I would also like to break down a specific part of this definition. This part is “the condition of being unable to do things in the normal way.” What is the normal way? Isn’t everyone’s normal different? “My normal is to live my life sitting down, I know nothing different, just like it is another person’s normal to live life standing up, they know nothing different either. “So how come one normal is seen as the correct way and the other is pitied? If we all try to be the same and do everything the same or normal ways we will lose what makes us unique. Thank you Jessica for sharing this! I have used this phrase as I believe language truly shapes our perception and thoughts of certain things. I for one support you! Keep up the great work representing our country and inspiring us. Totally agree with you! Keep on keeping on! You are one strong lady! I am sure we’d all agree on being differently abled. So why wouldn’t the government legalize herb verses having a drink. Jessica: To say you are amazing is an understatement! You will undoubtedly continue to make an impact on society. Bermuda is proud of you, and the Island looks forward to the contributions you will make when you return. Meanwhile, keep on track racing, and uplifting people with your positive attitude. Thanks BerNews for this wonderful and uplifting article.